Is it really love or are you just trying to fill a void that only God can fill? Become okay with being alone then you can master togetherness. I think we all go experience that dating drought where our phones stop ringing, DMs get drier than the Sahara desert and you feel free. 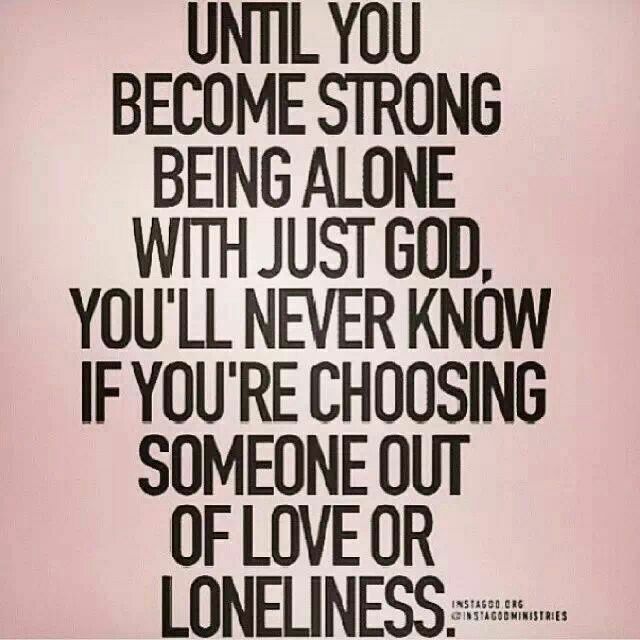 Oftentimes loneliness can creep its way into our lives and it’s strange because we haven’t experienced it in a while. It can cause you to wither away and become isolated and place limitations on your creativity. Placing in your spirit the need to laugh again and someone to reassure you that it’s going to be okay A SOULMATE. It can cause a desire to fill a void all the while building a desperation. Causing you to forget how to create your own happiness and forget the distinction between loneliness and aloneness. Loneliness is a want for attention, understanding, and reassurance from another being, seeking or waiting for a companion. It’s feeling incomplete with oneself. It’s a soul-urging desire to share your life. It’s what happens when you feel drained from doing everything on your own. That thought process that if only you could find someone it would be prayers answered. Aloneness self-strength built from deep down within and allowing it to flow through you. Enjoying your own company and finding pleasure in self-created activities. It’s not conforming to the patterns of this world but living to your fullest potential not being swayed by others thoughts or opinions. A wholeness with an inner spirituality check. My opinion is that Loneliness is what more often referred to. Our newfound culture values have been based on the portrayal that happiness should only be found through family and coupling. Loners aren’t the “chosen ones” and if you’re single “Oh you’ll find someone soon.” With lives getting more busy day by day (technology use, demanding work schedules, & overloaded schedules) this limits the actual face to face deep connection times. Nowadays it’s even hard to grasp and hold onto someone’s attention when delivering good news. this results in people choosing to fill voids with the first qualifying person that comes up. You jump from one relationship into the next. You are ‘bored’ with yourself and can’t think of even spending an evening alone with yourself. Loneliness haunts you. You settle for a person you barely even know past his or her name. Understanding and relating to someone is something you don’t really care about. Just because you like the sound of saying you have someone. You are more in love with how your partner looks than how he perceives the world. You fall in love with being a “couple”. You change your values and self-beliefs just to be with that person. Ex. eliminating worthy friends, religion, or strong beliefs. Relationships end your search for the next best thing you don’t allow yourself the healing process. You cover up the hurt and camouflage it with newfound excitement. If you can relate to any of these I challenge you to love yourself again. Forgive yourself know and allow yourself time to find out who you truly are then you can begin to find someone else. Surround yourself with good people and good vibes and before you know it you’ll be yourself again!